Happiness is almost a world-wide obsession these days. The self-help shelves of bookstores and online websites are laden with offerings that promise to help you find or achieve happiness. But can they? Happiness could be defined as simply “feeling good”. It doesn’t mean life is perfect but rather that our lives generally have a sense of direction, purpose and meaning. When we have an overall sense of satisfaction and contentment we can say we are happy. For many though, happiness is hard to obtain. In fact, research is showing evidence of a rising tide of this spirit of unhappiness in most advanced societies. A decline in the number of people who regard themselves as “happy” is being documented and seems to be consistent with the staggering increase in cases of depression in the last decade. Sadly, there has been a 400 percent increase in anti-depressant drugs prescribed and close to 10 percent of us now take mood-enhancement drugs for this current common problem which was once a rare condition. One of the downsides of this “loss of happiness” is the need to replace what has been lost with external sources such as alcohol and drugs, food and overeating, relationships or material items. Some of these things may give temporary relief but do not provide long-term happiness, joy, peacefulness or contentment. Could it be these things are being lost to us as our world becomes more and more sedentary and inactive? The widespread lack of physical activity in our modern technology driven “easy, comfortable” lives means we experience lowered endorphin levels on an ongoing basis. 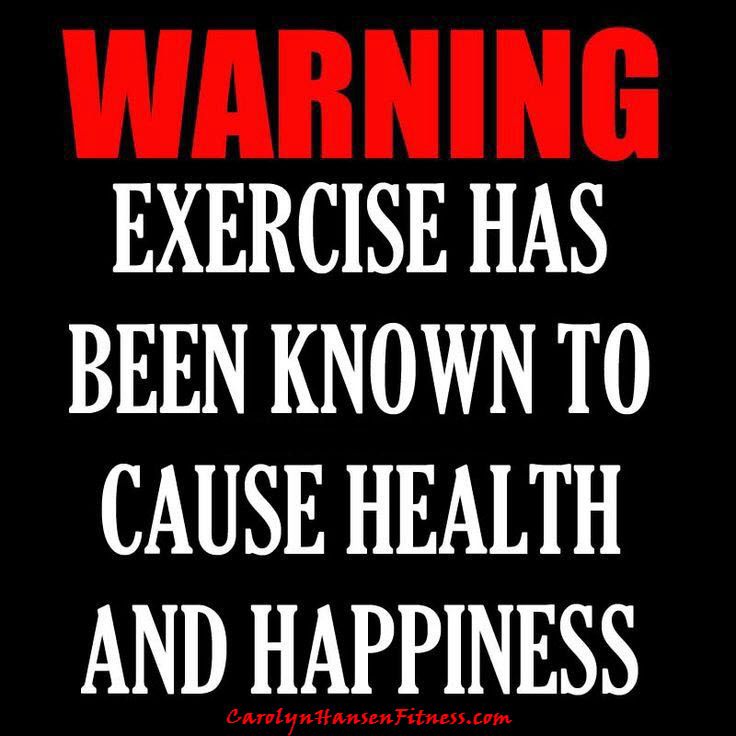 Endorphins are nature’s “feel good” hormones and are manufactured in the brain during intense physical activity. 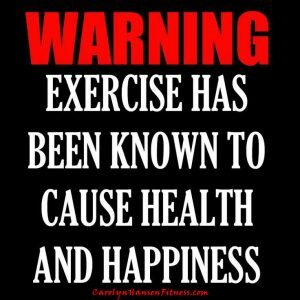 Endorphins lift your mood, calm you; relieve stress AND make you happy. They elevate your mood long after the exercise session has stopped, and help to keep us mentally and emotionally stable. You could call it “meditation in motion”. 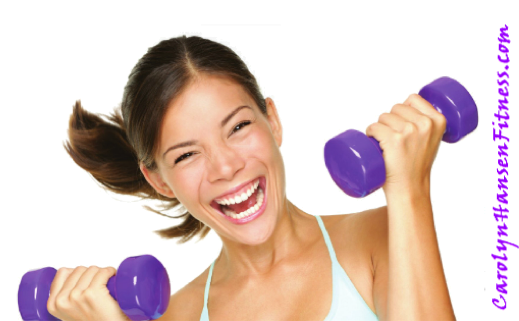 After an exercise session, you will often find that you have forgotten the day’s irritations and when you regularly shed your daily tensions through movement and physical activity, the resulting stress relief, energy and optimism boost can help you remain calm and clear in everything that you do. It spills over positively into every aspect of your life. Many people are missing out on this natural “inner” magic because they think they are too busy, don’t have time, are too stressed or that they simply don’t need to bother to take time out to exercise. But when you neglect your health and your body all of your life goals are balancing on a shaky platform making being “happy” so much more elusive. Happiness is definitely one of the key ingredients to health. Improving fitness not only positively affects the outside of the body, but affects our “inner sense of well-being” as well. This goes hand in hand with being “fit.” You often cannot put your finger on it or cannot identify it – you just feel really good…inside. It is an inner awareness, an inner peace and harmony, a feeling of being whole and complete within oneself and from this radiates happiness – all from the inside out. This then leads on to that state of appreciation, sense of satisfaction and contentment with your lot in life and finally a perception of balance and peace. We may wonder why our culture does not nurture this and prefers to have us popping pills with harmful side effects. No pills can ever match the feelings that physical movement can give us…and…..no prescription required. Somehow; we must once again take pride in being in control of our own life, our health, our body and our well-being and the answer is not in doctors and pills – it is inside of each of us. We have all heard the saying “happiness comes from within” and the good news is, this solution is available to all of us, is easily accessed for little cost except a little time and effort. The challenges that arise in our senior years can be anticipated and planned for by making smart decisions now – those that contribute to our ultimate goal of healthy longevity. All my products support a whole body approach that supports both the body and the mind. If you are serious about achieving a truly healthy lifestyle, one of youth and vitality – “Reclaim Your Longevity” was created for you.